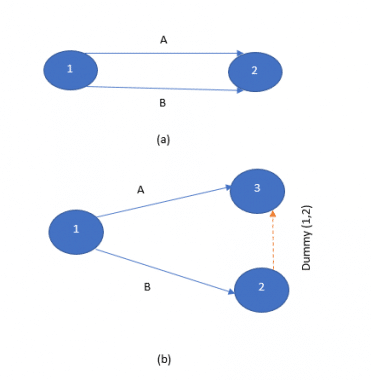 The representation and more features of dummy activity in network analysis are explained below. Dummy activity forms a connecting link for control purpose or for maintaining the uniqueness of the activity. A dummy activity is used to maintain the network logic and to avoid ambiguity. An activity followed by a dummy activity can only be completed once the activity or activities preceding the dummy activity is completed. A dummy activity can be either critical or non-critical. It becomes a critical activity when the earlier start time and the latest finish time are equal. A dummy activity, being an imaginary or redundant activity, is represented by a dotted line with an arrowhead. The numbers on the terminal nodes are used to represent a dummy activity. A dummy activity is clearly explained by an example in figure-1. Consider 2 sets of activities as Set 1 and Set 2. As shown in the network above, A and B can be performed serially. The activities C and D can also be performed serially. But practically, the activity D of set 2 can only be performed after completing the activity B of set 1. So a dummy line is drawn between node 2 and node 5 indicating that the activity D can only be performed after the event 2 is over. A dummy activity can be used to prevent two arrows with a common beginning and end points. This can be explained by an example as shown in the figure-2. Consider the arrows of activities A and B. Both start from node 1 and end at node 2. This arrangement is difficult to conduct computations and the network loses its uniqueness in its identification. Such inconvenience causes frequent mistakes during network analysis. It is difficult to represent an activity having two sets of operation running parallel to each other in a network. The use of a dummy activity helps to give a logical representation without difficulty in interpretation. For example, consider the network given in figure-3 where there are two activities Q and R. Both have a common end node. 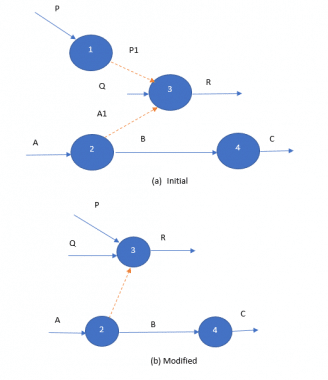 The predecessors of Q are O and P while that of R are P and N.
Too much use of dummy activities in a network creates confusion. Initially, liberal use of dummy activities is followed to fulfill the requirements of inter-relationships between activities. This network is later modified stage-by-stage by removing unnecessary dummies to finally obtain a simple network. This is explained by an example below (Figure-4).